Mankind has been fascinated with the animals since prehistoric times. Some of the earliest cave drawings of bulls have been found in Lascaux, France. The Mythic Bull of Heaven is a prominent character in the Epic of Gilgamesh, which is thought to be a close parallel to the Biblical versions of The Great Flood and The story of Adam and Eve. Many ancient cultures and modern religions across the globe view the Bull as sacred; in ancient Egypt, the cult of the bull deity Apis was an integral part of religious ceremonies in the country. In the Hindu tradition, the powerful god, Shiva, is often depicted as riding a bull. To symbolize their entrance into manhood, boys from the Hamar tribe in Ethiopia jump over the backs of the village's strongest and most virile bulls. Countless important religious festivities and rituals incorporate a healthy bull as the highest and most noble form of animal sacrifice. Tribal patterns have strong connection with the native cultures from which they are derived, whether it is the plains of North America to the highlands of Nepal. Tribal Bull tattoos are deeply rooted in Nature, Paganism, and Spirituality. These designs are also associated with Power, Strength, and Fertility, all of which were integral elements of countless Pagan cultures. As the Rodeo cowboys of Australia, Spain, Mexico, and the Americas will tell you, an angry bull is a deadly one. Persons who identify with these animals have an air of danger and excitement. The thrill of conquering a powerful, raging creature gives men who overcome this challenge, the feeling of Invincibility. A raging bull symbolizes raw masculine energy. Also see Bull Riding Tattoos. Taurus is Latin for 'bull' and the Zodiac sign is a representation of the outline of the animal's head. This constellation is one of the oldest recorded ones in history, with references from ancient Babylon, Egypt, Greece, and Mesopotamia. Persons with this tattoo design identify strongly with the traits of a Taurean; they are powerful, resilient, and steadfast in their actions, regardless of outside influences. 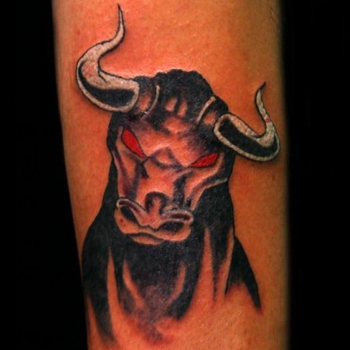 Bull tattoos with Celtic influences are deeply rooted to Spirituality and Paganism. These designs may include an image of the bull or a series of Celtic knots that have been shaped to resemble the outline of the animal (namely its head). Celtic Bull tattoo designs hark back to a connection with the powerful spiritual elements of Mother Nature and Paganism. Although a skull is the epitome of Death and Destruction, a bull's skull - much like a buffalo skull - symbolizes Life and Prosperity in Native American folklore. In fact, the two are often interchangeable. Contrastingly, seeing a bull's skull during the days of the Wild West meant that death was near, since these bones were usually found in parched, untamed lands. It isn't uncommon for sports teams to incorporate images of the Bull into their team logos. The animal represents Power, Strength, Resilience, and Fearlessness, all of which are characteristics of the greatest athletes. Proud of your college team? This design is the insignia of the football team of University of Texas at Austin, a team that has been around since 1893. The Chicago Bulls have been around since 1966. The team has seen the likes of legends like Michael Jordan, Derrick Rose, and Scotty Pippen, but never fails to wow its fans. Choosing the right tattoo design makes all the difference between having a good tattoo and having one that you'll be proud to show off to your grandkids years from now. When making your decision, it's important to ask yourself, "What variation of the design best fits my personality?" The best ones are those that have significance to you. If you need some inspiration, then visit our design page at www.itattoodesigns.com or take advantage of our Custom Design Service, where our team can design a truly unique piece for you. When making your decision, it's important to ask yourself, "What variation of the design best fits my personality?" The best ones are those that have significance to you. If you need some inspiration, then visit our design page at www.itattoodesigns.com or take advantage of our Custom Design Service, where our team can design a truly unique piece for you.